Want to arrive in style to your prom? A special birthday treat? A memorable anniversary? Or just for fun! We believe a horse-drawn carriage has what it takes to make a truly unforgettable experience. For a special treat – why not try our pub drive? We drive you and your guests around quiet Oxfordshire country roads and then you can have a relaxed lunch at the local Michelin starred gastro pub The Nut Tree! Or maybe try it yourself, with a driving lesson? Our grandest carriage is an original Victorian carriage drawn by two stunning black Fresian horses. The carriage can be used open or fully closed, ensuring your occasion is a success, regardless of the weather. 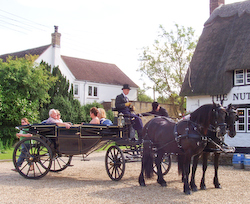 We also have a selection of other horses and carriages to suit any occasion. See the gallery for photos of some of the horses and carriages available. And talk to us about more options! Based in Oxfordshire, we offer our services throughout the south of England.